About Us – AFRIKAYA – Gambian childrens' charity based in Pewsey, Wiltshire, UK. Afrikaya is a Pewsey [Wiltshire] based charity, with full charitable status, registered with the Charity Commissioners in the UK . The charity is run by Geoff and Di Miles, Sanjeen & Helen Payne-Kumar. It is ultimately their responsibility for governing and directing how the charity has been created, managed and run. The four of them offer their time and diverse skill set to the charity on a completely voluntary basis. This skill set comprises: management, finance, marketing, business development, product & strategic management, child protection, youth work, voluntary sector management, counselling & psychotherapy, social studies, fundraising and events …….. and a hell of a lot of passion. They are all cogs in a progressively well run charitable organisation, not only providing nursery education to children under 7 years old, but are now also providing jobs for 14 people and training to the local community. Alimamo Cessay:​​ Afrikaya Charity Representative & Project Manager. For information about the teaching staff and the ground staff, please go to The School. Where does the charity operate? The charity has built the Afrikaya Nursery School in New Yundum, Kombo North, West Coast Region, The Gambia. 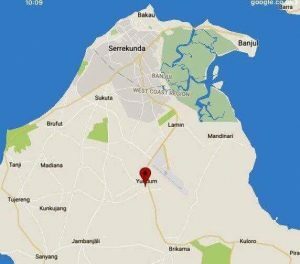 New Yundum straddles the Brikama Highway, and is 27.3 kilometers from Banjul [the capital] and 8.2 kilometers from Brikama. Until recently, the area was a rural community. It is now a newly developing township, but with few facilities, particularly to the west of the highway where the school is now situated. Nursery age children from this community previously had a 3 kilometer walk (crossing the dual carriage way) to the nearest nursery school, and 3 kilometers back home. 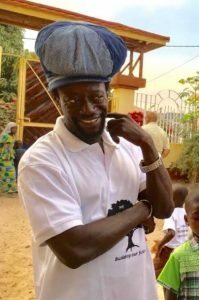 Afrikaya’s Representative in The Gambia is Alimamo Ceesay, a trustworthy and proud Gambian, who has been responsible for overseeing the building and development of the school since it was just a patch of land in 2010. He is now project managing the rest of the building and manages all of Afrikaya’s finances in The Gambia. Alongside the Head Teacher (Ismaila Sama), he manages the school. For regular updates of Afrikaya’s progress and fundraising events, you can join our Facebook group.